I received a nice note from Frank R. Brownell III, shown below, which meant quite a lot to me. He wanted to thank me for some of the writing I have contributed on behalf of his company, which of course have led to radio spots and other indirect support of his very fine company. 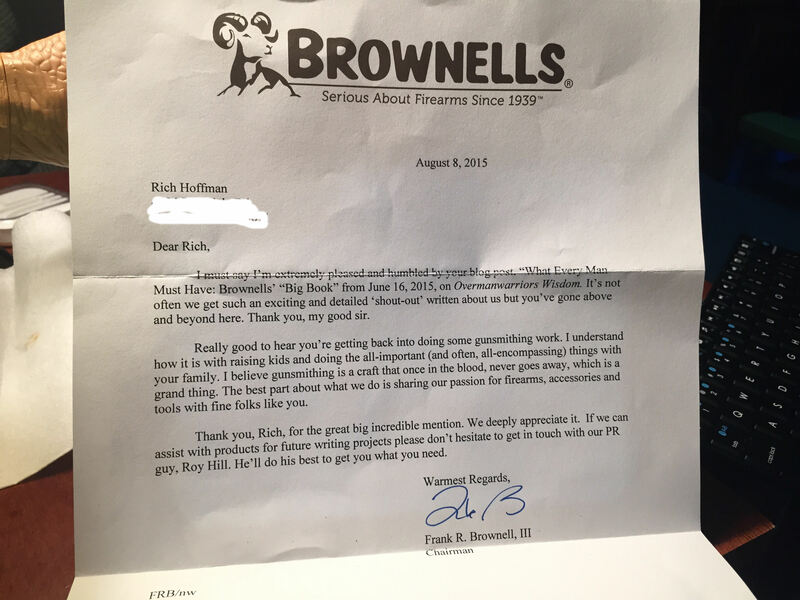 I loved Brownells as a young man when one of my very first jobs out of high school was a gunsmith, and I still love them as they are the best of their kind in the world regarding gunsmithing equipment. Guns are the keys to American freedom protecting capitalism from the treachery of socialism. Governments—all governments—are inclined toward socialism so we need guns to keep those back-of-the-train bureaucrats in their pin-headed offices, and off our backs. Not from violence, but from the knowledge of equality that guns provide to individuals who are always prone to aggression from collective organizations and institutions of consensus. The only reason that socialism has been such a slow boil in America hidden behind the changed names of the Democratic Party is because Americans have so many guns. And the people who keep those guns working are gunsmiths, making them one of the most important fields of endeavor in a free society. I have too many hobbies—entirely too many. I would need about 3000 years to develop them all. But out of them all, the one that I think is the most important is my love of guns. I’m not a person who has a tremendous number of guns. But having them, and being able to work on them is a value that to me is excessively valuable. That is why I originally wanted to be a gunsmith more than any other profession. When I was young and newly married, I was set to become a global adventurer—as a career. My experience at that time could only take me satisfactorily to such a destination. I had done just about everything and experienced so much before I even turned 18 that I was headed in that direction. While honeymooning in Gatlinburg, Tennessee with my country club oriented new wife, we picked that destination because I wanted to show her how the other half of life lived. That’s why we picked the blue-collar landscape of southeastern Tennessee to have our honeymoon instead of someplace like Hawaii. I always enjoyed the finer things in life, but I grew up blue-collar, so I was always able to maintain that balance. My wife was curious about that life, so we vacationed in a way that would show her those things while still living in the kind of luxury she was accustomed to. I found a chalet for us, took her to the finest restaurants in Gatlinburg at the time, and we drove there in our BMW shortly after the wedding. The view out our window was of the Smoky Mountains, it was very remote and spacious, and we had the whole place all to ourselves. It made for a wonderful honeymoon in the fashion a young couple would expect to entertain themselves who are newly married. She was comfortable and happy, thus she was open to the kind of places I liked to go—like leather shops, gun shops and knife stores. This was all new to her, so we wanted to capture that moment in a bottle and I decided that I’d become a gunsmith to give her that kind of life 365 days a year 24 hours a day. That was when I discovered for the first time Brownells. They had their act together and walked that fine line between luxury and blue-collar sentiment seamlessly, which enabled me to bring a little Gatlinburg to our daily life which made my wife very happy. Soon we were on a path unique to us and making a living that wasn’t as Champaign glass specific as what was expected of us. She was raised to be a country club fashion model, and I was personally comfortable in tents, campfires, and luxury hotel accommodations anywhere on earth. We were trying to do something different and that was to fulfill a new idea we came up with during our honeymoon that combined everything into a nice domestic life that we both wanted, but had no real examples to follow—leaving it largely to us to create from scratch. Brownells made that dream a possibility that we clawed at for several years. We started having kids and from there the pressure increased and our goals as a couple become much more difficult to achieve. I took a step away from the gunsmithing because increased demands to have a more socially acceptable living, and the difficulties of being so young trying to do something that progressives were trying to destroy in the years leading up to Bill Clinton were ominous. This made the dream we had seem so hard to reach which put a lot of pressure on us as a young couple. I am a lot of things to a lot of people—but one thing that is completely consistent across the spectrum of thought is that I am extremely tenacious and I never forget anything. It is likely the aspect of me that is most recognizable to other people. Once I get my hooks in something, I never let it go until I get what I want or need out of it. If I want to do something, I do it—hell or high water—nothing will stop me. Nothing. That means I sometimes put things off for a few decades until I have the time or means to get back around to them, and that is what I did with gunsmithing. I took some time to catch things up, deal with the encroachments of modernism seeking to impose itself on our married life, and keep the coals of gunsmithing warm in the back of my mind always with that vision of a life created in our imagination at Gatlinburg during our honeymoon alive no matter what was going on. 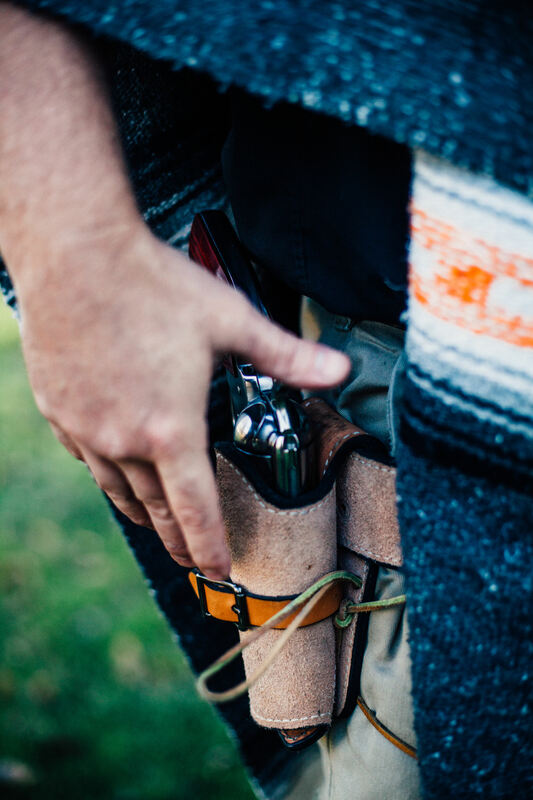 During our honeymoon we went to several leather shops and looked at boots, cowboy hats, and gun holsters and we wanted a lifestyle that incorporated all those elements. For a country club girl, someone who was actually being groomed by the John Casablanca modeling agency to do photo shoots for Cosmopolitan in New York and whose parents were members of the very prestigious Becket Ridge Country Club at the time—this life of leather, lace and red, white and blue Americana complete with bullwhips was something very appealing. It was a way out of the mundane conversation often conducted at power lunches—which are important for business, but often leave people short on intellectual stimulation. So she was all in if I could provide for her, which was a lot of pressure on me—it was a lot to sign up for. She literally had her pick of who she could marry, and there were plenty of up and coming lawyers, sons of business tycoons, and well-to-dos offering to sweep her away into a comfortable life continuing her country club expectations. It takes a lot to sign up with a woman knowing there is a line from here to the moon of men wanting to sweep her up if you stumble even a little bit. We determined to live a traditional life as a couple to seal the promises we made during our honeymoon—which included bullwhips, cowboy hats, and lots of firearms. To understand that promise made in Gatlinburg, Tennessee so many years ago—the kind of America we committed ourselves to, is to understand what kind of company Brownells is. They are technically modern, traditional as a business, creative—but place at the head of their business model a sincere appreciation of quality and integrity. When you get something from Brownells it has a feel of quality to it, no matter what it is. That is because of their value system, which is the kind of America my wife and I made a decision to defend—any way possible. We are at a stage in our life where that tenacity has outlasted many of the oppositions presented and the restrictions upon us are breaking loose. That’s why it’s no surprise to us that the first contact I made after that weight was lifted off me was back to Brownells. Sure it took over twenty years, but who’s counting? They represent the kind of America we fell in love with during a dreamy honeymoon. Brownells is the best that our country offers as a free market option that protects the Second Amendment with gun maintenance while setting the industry standard. As Cabela’s and Bass Pro expand their outdoor shopping empires—much to my liking—it is important to remember that Brownells did it first. When the nation was reeling under progressive strife, Brownells held strong so that the rest of the country wouldn’t lose themselves to the encroaching progressivism that sought to infect the only free country left on planet earth. Brownells did more than just preserve gun maintainence, it held down a family friendly business model that values good old-fashioned conduct which built the nation to begin with—and they have endured successfully in spite of the opposition against them over many, many years. So it meant a lot to me to receive the nice note from Frank Brownell, III. He didn’t have to send me a letter, and he certainly didn’t have to type it up and mail it personally to me. He could have sent an email or a tweet. But he didn’t, he sent a well thought out letter with a personalized signature because it mattered to him to reach out and maintain personal contact with people he values, which is at the heart of why they have been such a successful company. They simply are the best in the business, and I’m so happy they are out there. I’m not only getting back into doing some gunsmithing, but I’m starting an entirely new hobby that will require a lot of work with Brownells. It is part of something I think is extremely important given what we know about the progressive attempts to attack the Second Amendment and the defense of freedom that personal firearm protection provides. We need to re-sell freedom to the American people, and the best way to do that is with firearms—and I plan to capitalize on that for the sake of marketing, and sentiment. My wife and I still have those original dreams, and we are not the kind of people who let dreams slip away. And those dreams are more possible because of companies like Brownells. They are what we are fighting for—good people, good ethics, and always striving to provide good products in a way that is specifically American. They are the foundation of that dream, and I will always cherish them. The feeling is mutual, Frank. Keep up the good work, you guys are not alone.